There are many misnomers and myths surrounding weight loss surgery. It is quite a common procedure these days and the marketing and information surrounding this topic can often be misleading. Details regarding weight loss surgery can also often be misreported by the media. 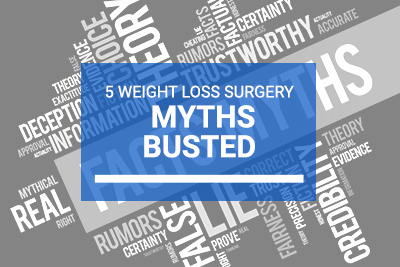 Here are 5 of the most commonly reported myths around weight loss procedures. When weight loss surgery was first introduced in the 1970 and 1980s it was groundbreaking. Doctors were inundated with information and queries. They also needed to gain experience in the field. For example, incisions were bigger, hospital stays were longer, pre-surgery requirements weren’t as extensive and failure rates were higher. Today, along with greater technology, information and experience, the procedure is much less invasive and success rates are greatly improved. This is not a procedure undertaken lightly. It is not an option after you put on a couple of kilos after “letting yourself go” or not being able to shift those last few kilos after having kids. The patient will probably be over a certain BMI number and should have attempted to lose weight in other ways possibly through medically assisted alternatives or weight loss management tools. It has been said that the surgery is the easiest part of the journey. Before and after the surgery the patient needs to adjust their lifestyle to one of creating better habits for themselves including a healthier lifestyle and eating regimes. Otherwise, the surgery will be pointless. In some cases, weight loss surgery is the patients last alternative and is a lifesaving procedure. Usually, after a bariatric procedure, there is a period of reintroduction to the texture of food to allow your body to adjust to the new way it digests meals. First, the patients’ food is liquefied, then pureed, followed by soft and finally solid food. Weight loss surgery is one of the preferred options for people with Type 2 diabetes. The cure rates following surgery are very high. Due to certain health related conditions with morbid obesity, some insurers do cover certain parts of weight loss surgery. Criteria’s are usually very strict. You need to contact your health insurer to make sure exactly what those requirements are and your eligibility before you make any decisions about going ahead with any bariatric surgery. Click through to learn more about weight loss surgery costs.